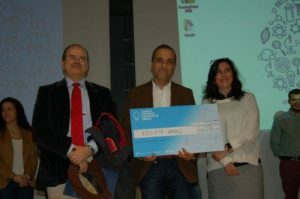 Awarded in the Eureka-Concurso Nacional de Ciência (Eureka Portuguese Science Contest), which took place at the Faculty of Health Sciences (FCS) of the Universidade da Beira Interior, to the researcher Renato Abreu, MSc. The award-winning work is integrated in the research project Online Education and Social Web on mobile learning in health, coordinated by Professor Teresa Cardoso, PhD. Given by Fundación Universia, Spain to the research on an international case study Contributo Exploratório para uma Abordagem Digital Inclusiva: o Caso das Universidades de Ensino à Distância (Exploratory Contribution for an Inclusive Digital Approach: the Case of Distance Teaching Universities), presented by the researchers Marina Moleirinho, MSc, Professor Sofia Malheiro, PhD, and Professor Lina Morgado, PhD. 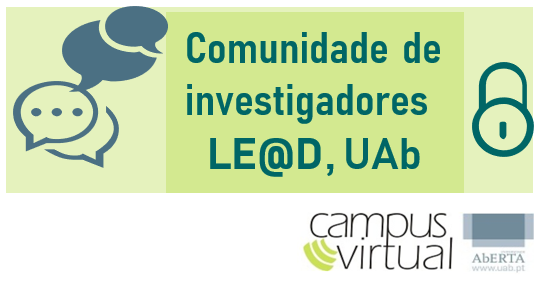 The research is part of our laboratory research line on Educação à Distância na Sociedade em Rede (Distance Education in the Network Society). Given by the IMS Global Learning Consortium (IMS GLC) to the Virqual Project: Harmonizing Virtual Mobility and the European Qualification Framework, integrating Professor António Teixeira, PhD and Professor Branca Miranda, PhD. Conferred by the European Foundation for Quality in ELearning and certified by UNIQUE – The Quality Label for the use of ICT in Higher Education (Universities and Institutes). The EFQUEL Award is given to institutions that use Information and Communication Technologies (ICT) to carry out their highly innovative teaching and learning processes. 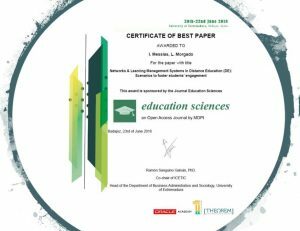 The selection of the winners complied with the strict quality criteria of EFMD CEL – Technology-Enhanced Learning Accreditation for ICT-based learning programmes, as well as the EUROPACE methodology. LE@D and its researchers were evaluated in this attribution. Attributed by The european school 2.0 at the EDEN Seventh Open Classroom Conference to the paper Learning to Teach in Second Life, by the LE@D researchers, Angelina Macedo, MSc and Professor Lina Morgado, PhD, and the paper The Use of Internet Social Networks in a Pedagogical Context: A Case Study in a Basic Portuguese School, by the LE@D researchers Rita Oliveira, MSc and Professor António Moreira Teixeira, PhD. 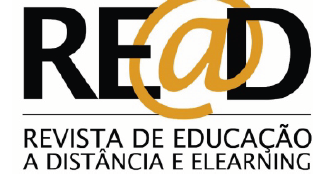 Attributed by the EDEN Annual Conference in Gdansk to the paper Evaluating Continuous Assessment Quality in Competence-Based Education Online: The Case of the e-Folio, by the researchers Alda Pereira, Isolina Oliveira, Luis Tinoca, Lúcia Amante, Maria de Jesus Relvas, Maria do Carmo Teixeira Pinto, Darlinda Moreira.